Any discussion on shaping, designing, repairing and riding surfcraft of any type or shape. Also a good place to ask the 'what board should I buy?' question. Given the success of the incut fish and the recent failure of my flexspoon project (pour foam couldn't handle the humidity here), I thought it might be interesting to combine the 2. This time I will be using the scoop out method, using a standard pu blank...rather than using a mould & pour foam like before. Now you're talking, that looks like being a really interesting build and a scorcher of a board- get on it! Inline singles are interesting, how does it ride? I'm doing a stubbie quad egg with a mate at the moment, and want a single box in it too. The wide point is fwd on my plans, so was thinking I'd have to move the fin box fwd too, and as a result have decided to add a single fcs plug at the tail, use a little nub fin to help stop it spinning out. So that inline has come at the right time, never seen it before! Sadly haven't ridden one of these Roy, but Fernando (who shaped it) is a fan, he's been riding them for a few years. He says it rides very loose- fast and drivey like a regular single fin, and it feels very good in turns- there is a bit of a language barrier (on my side more than his, my Spanish is pretty non-existent so I rely on his english) so the finer points of the experience are a bit hazy! Seems like it would hold better when pushed with that fin area split up back there, although there's a lot of room between the fins so how that affects the water flow I don't know. Fernando builds them with a sort of modern HP style outline too, not a 'retro single' shape at all- interesting idea all round although is it still a single or technically a twin?! Got a hold of small offcut of high density eps (think its eps250). Decided to use it to do a few more experiments with parallel profile boards. Going real small this time. 5' x 19" x 2 3/4"
2 1/2" spherical rocker, apex at the centre giving equal nose & tail rocker. single concave throughout, thruster set up with a more condensed cluster, same as found on the vanguard. Since the foam is quite dense this is getting a 4oz bottom, 6oz top. Should be interested to see how it goes. Best surf on it at the weekend. Nice groundswell resulting in steep and cheerful beachies. Holds really well for a wide tail. Got me into a few tunnels. Fast. Turns beautifully. Was worried it might be a bit wooden but alas no...put a kind of spiral v out the tail for a bit more of a roll through rail onto tail. The tail has a good bit of kick too and foiled out plenty. tynemouthmatt wrote: Got a hold of small offcut of high density eps (think its eps250). That certainly isn't a parallel profile board. Perhaps you mean parallel planshape? yeah, that is what I mean. Would.like to experiment with parallel profiles at some point too. The one from earlier in the thread finished off. Glassed with some flooring epoxy I was given, which worked out alright despite taking 3 days to set. Microballoon hotcoat, 60grit finish, rattlecan matt black. Not much attention paid to the finish as its more an experiment with the design, especially the rocker. A little project I have been working on with Northcore for one of there team riders. A final personal board before I bow out for a while. 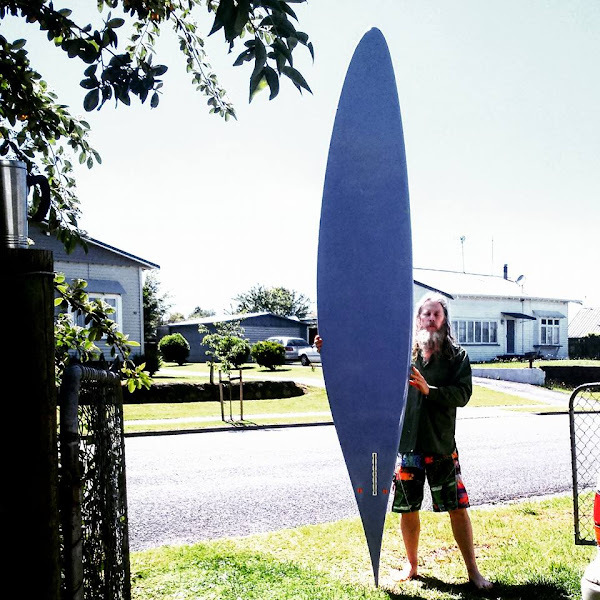 6'11" x 19" x 2 1/2"
Stafford cut out keel toeside, speed dialler quad heelside. Both fins a variation on the same keel design. Rolled to flat to spiral vee. 1/8" more vee on the heelside. Really foiled through the tail. Real rust finish on the hull and rails. Like that Matt. Ride report please when you've had a few? I just got this, and after one surf in in crap to mediocre conditions (exactly what I bought it for) it's a winner. 6'2"- I know, you're meant to surf Tomo's at 5'2" and then go on about how big they feel, but I wanted rail line and planing area while getting away with a 'shortboard' size. I honestly could surf one of these at 5'4" and have fun, but at this size it's a stealth longboard. Paddles beautifully, gets into waves nicely and it's a missile when it gets planing but can be thrown around without feeling clunky or squarely- well happy! Honestly doesn't feel weird or oddball but this seems like the place for it really. Tomo's only doing a limited number of shapes for Hydro outside his Firewire stuff so a bit one offish? Who cares, it's a great board. foam&function wrote: Tomo's only doing a limited number of shapes for Hydro outside his Firewire stuff so a bit one offish? Who cares, it's a great board. Cyclone Tuni didn't deliver but we got the board ( Now called the 'Witch Doctor') wet anyway, felt promising. Maybe not nearly weird enough for this thread but it certainly is a one-off. 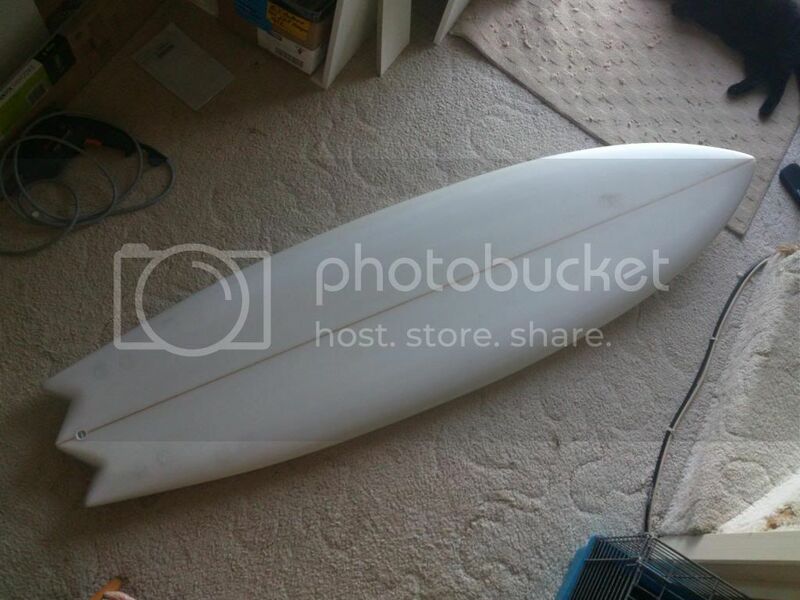 Recently bust the nose on my 7'2 2+1 magic-carpet/egg thing. It had a LOT of nose rocker so i just told the guy to cut six inches off the nose and try something different and i think it´s come out a lot more fun, if ugly as sin. proper backyard-bodge job but interesting to ride.